Our preventive services are meant to provide one special thing: peace of mind. With just two preventive appointments each year, Dr. Thomas Novak, Dr. Johannsen, and our team can make sure that you never have to worry about your teeth whenever you smile, eat, or laugh. That’s the real goal of dentistry: to enable you to live your life without having to worry about dental problems. Below, you can learn more about all the ways we can help you and your family have healthy, beautiful smiles year after year. When you come in for a routine checkup, it will consist of two main services: a dental cleaning and an oral exam. These are the two cornerstones of dentistry. They are f the best ways to protect a smile from dental issues while helping it look great for a lifetime. For a dental cleaning, one of our skilled hygienists will use sophisticated tools to break up and clear away plaque and tartar buildup on your teeth and gums. This cleaning is especially good for reaching those difficult spots that your brush and floss can’t touch. Basically, it helps close the gaps in your home routine and keep your smile free of cavities and gum disease. After your cleaning, Dr. Novak or Dr. Johannsen will perform a thorough oral exam where they’ll look for the signs of dental problems such as tooth decay, defective restorations, gum disease, oral cancer, and more. By coming in for these exams regularly, you’ll give them the opportunity to catch any issues early, which makes treatment quick, conservative, and predictable. If you have a little smile at home, we would love to see them! 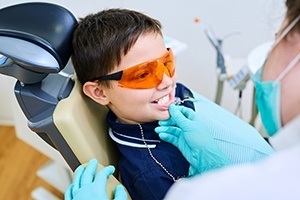 Bringing your child to the dentist at an early age is one of the best ways to avoid complicated dental problems in the future as well as help teach them how to take care of their new smile. Our team has years of experience treating children, and we’ll use just the right combination of procedures, patience, and a gentle touch to make sure they have a great time while we keep their smile healthy and strong. Bruxism is a condition where a person unconsciously clenches their jaw and grinds their teeth most often while they are asleep. This puts a tremendous amount of force on the teeth, often causing them to wear, crack and break! Fortunately, we can help manage this sneaky problem with something called a nightguard. 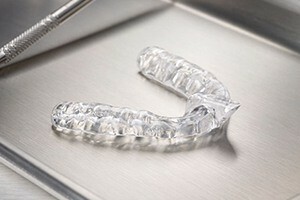 It is a small, comfortable, custom-made mouthpiece that’s worn to bed, and it keeps a patient’s smile safe by providing a protective but comfortable barrier between the teeth. Fluoride is a naturally occurring mineral that is found in many foods and public water sources, and it’s extremely helpful because it actually strengthens the teeth against tooth decay. It’s important for children while their teeth are still developing, and it’s al great for adults who are prone to getting cavities due to the aging process or many prescription medications. 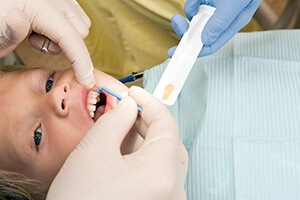 As part of a regular checkup, we can give you or your child an extra boost of fluoride with a fluoride treatment. By simply painting fluoride on the teeth we can provide an exceptional level of protection for those patients who need it most. It’s quick, it’s easy, and it’s extremely effective for keeping the teeth healthy. Most of your dental care actually happens at home with routine brushing and flossing, and it’s very important to use the right products to make sure you’re giving your teeth and mouth everything they need. The wrong choices can often cause tooth sensitivity, tissue allergies, or staining of the teeth. If you need a recommendation, our team will be more than happy to discuss which toothpastes/mouthwashes would be best for your particular smile To make things even easier, we can supply many of them for you if needed. Whether it’s been 6 months or 6 years since your last appointment, these services can give you exactly what your smile needs to stay healthy and beautiful for a lifetime. To schedule your next appointment, simply contact us today.